Whether you are trying to come up with the perfect name for your new parrot, contemplating the notion of breeding your parrot or considering the introduction of a new feathery friend, you will need to know if your bird is a male or a female. Since most breeds of parrots are monomorphic, meaning that males and females do not exhibit any differentiating physical characteristics and they lack external reproductive organs, determining the gender of your bird is no simple feat. Surgical and laboratory screening methods take the guesswork out of sexing your parrot. If you purchased your parrot from a reputable breeder or pet shop, you probably received documentation that states the gender of the bird. Most breeders have DNA tests performed on their young birds prior to the sale, and the report accompanies the parrot to his or her new owner. If you acquired your parrot from a rescue organization or other venue, the revealing certificate may not have been available. Even the chattiest parrot is not likely to tell you his or her gender, and it will be up to you and your veterinarian to solve the mystery. In vent sexing, the parrot may be gently palpated along the pelvic bones, which are located behind the vent. If a dip is felt in the center, then the bird is likely a female. Visually determining the gender is only possible in a handful of parrot breeds, including the Eclectus parrot. These few breeds display differences in coloration on their feathers. Neither of these methods is reliable, and in most breeds of parrots, other procedures must be implemented in order to accurately determine whether the bird is male or female. These tests include blood sexing and surgical sexing. 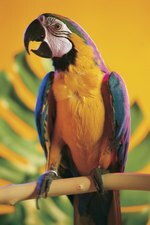 Once you welcome a parrot into your home, it is a good idea to bring your feathered friend to an avian veterinarian for an initial health examination. An avian veterinarian specializes in birds, and he will be a valuable resource in caring for your new pet. As part of the examination, he may recommend drawing blood so that a chemistry profile can be run to determine the overall health status of the bird. Part of the blood sample can also be used for a DNA blood test that analyzes chromosomes to determine the gender of the parrot. This noninvasive sexing technique is inexpensive, and it is the safest and most accurate method used for sexing birds. The disadvantages of blood testing include the potential for the sample becoming lost in transit and the possibility of laboratory error. This method allows for direct visualization of the parrot's reproductive organs. The parrot undergoes general anesthesia, a small abdominal incision is made, a tube is inserted, and a fiber optic endoscope is fed through the tube. The surgeon is then able to visualize the gonads of the patient. Female parrots have one ovary, normally located on the left side, and male parrots have two internal testicles. The parrot is then tattooed on the wing to designate the gender. One of the advantages of surgical sexing is that the surgeon can also evaluate the health of the bird's major organs, such as the liver, spleen, kidneys, heart and lungs. The disadvantage of any surgery is that no anesthetic procedure is without risk, and the experience is stressful for the parrot.